“We recycle,” is proudly imprinted on a set of green recycling bins we’ve used for several years at our house. That same phrase is common now on bins in many public places. Most grocery stores offer recycling for the plastic bags they generously hand out to customers. It’s the easiest comeback for any of us feeling green guilt. “We recycle,” a busy mom can say with a smile — and usually we’re sincere. Did you know that at least eight out of ten plastic bags, sacks or wraps never gets recycled? According to the United States Environmental Protection Agency, “In 2010, the category of plastics which includes bags, sacks, and wraps was recycled at almost 12 percent.” Of course, some of us are so frugal that we’re reusing those bags for something else around the house. But the numbers tell us that most people must not be recycling their plastic bags at all. Environmental watchdog groups like Waterkeeper and the Sierra Club routinely find examples of plastic bags polluting our waterways and endangering wildlife. Environmental scientists tell us that even when plastic breaks down…it’s not good for any living creatures, including humans. As a parent, I’m not only concerned about wildlife elsewhere on the globe, but about what a culture of pollution means for my children’s future. Grocery store baggers are so eager to please that I notice they have a knack for putting the fewest possible items into a single plastic bag. Sometimes they’ve wanted to take a large bag of food like potatoes that’s already fully wrapped and place that in another bag! It’s encouraging that when I remember to bring my own reusable bags to the grocery store, the staff is cooperative. The only downside I see to reusable bags is that they need to be washed and air dried from time to time.Perhaps you live in one of the numerous cities dotting the Plastic Bag Ban Map that already discourages single-use plastic bags at the grocery store. For those of us who don’t, “we recycle” is losing its punch as a politically correct comeback. Not only are most of those bags not recycled, but they require fossil fuel energy that our polluted planet can scarcely afford to burn. 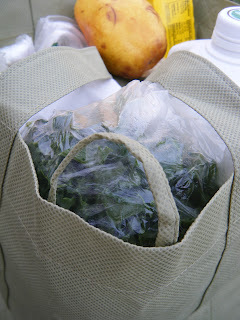 Without much effort, we’ve found several alternatives to those thin plastic bags. Our family is so frugal that we’ve been saving every free reusable bag given away for years. While I love to sew pretty totes for other uses, I haven’t yet found time to construct the sturdy ones I want to make for shopping trips, but it’s on my to-do list. One store where we shop offers the free use of its stockroom’s cardboard boxes. It’s easy to tote the groceries home, then crush the box for our recycling bin. We’ve not avoided the plastic bags altogether, but it seems less of an inconvenience than a simple matter of changing habits. The practice I’ve gotten much more confident about is simply saying “no thanks” when the clerk tries to give me a bag for just a couple of easy-to-carry items. Disclosure: As a contributing blogger writing about the plastic bag ban, I may be entered for a giveaway.